Should you read this update? Only if you are curious about how a diversified VC fund focused on blockchain and ‘decentralized finance’ can thrive despite the decimation of cryptocurrency valuations. Fund II is now open to qualified accredited investors (see disclaimers below) and several existing investors in Fund I have signed up for Fund II as well. Most have funded their commitments already. However we are not investing from it yet, while we tweak strategy to adapt to the changing blockchain opportunity. Accredited investors who are qualified clients may wish to check out Fund II (sign up to learn more). At this point our maiden fund is fully invested across a portfolio of 27 holdings (view portfolio). We are thrilled to have companies like Circle, Algorand, Adjoint, Tari Labs, mTonomy, and Staked in our portfolio. We have always maintained that blockchain is a risky sector but for those with tolerance for this risk, investments in the sector present asymmetric upside. 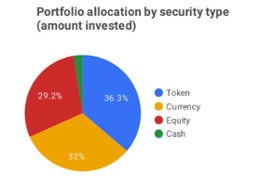 The investment team at ACV strives to minimize the risk by following a strategy of “over-diversification” — by which we mean more diversification than a typical venture fund. This diversification has played out across several dimensions but I will touch upon just a couple this month. Store of value: Crypto-currencies like Bitcoin attract a lot of attention for being “digital gold” or a store of value that can appreciate and in the 2017–2018 era, the use case for blockchain has primarily been as a store of value. Our 25% exposure reflects this reality. 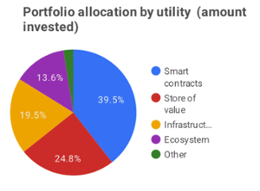 Infrastructure and ecosystem plays make up the rest of the portfolio. These are companies emerging as technology vendors or market makers in the world of decentralized finance (“de-fi”) and next generation fintech called Fintech 4.0. I have been amazed by the response we have received from so many of Fund I investors as repeat investors in Fund II. We appreciate their continued support and confidence in ACV. Those who have already funded your commitments to Fund II, please note that we are not investing from the fund yet while we are focused on tweaking strategy, finalizing some of our ancillary legal structures, and wrapping up the fund raise. 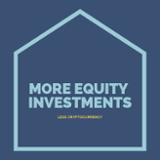 Please fill out this form to learn more about our diversified venture capital approach to investing in the blockchain opportunity.